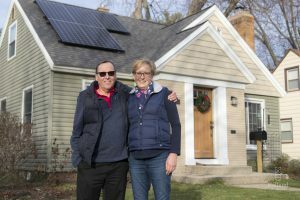 Roy and Mary Cole’s 26 th Street home is the first to install solar panels through the city’s Home Energy Retrofit program. Roy and Mary Cole have a long-standing interest in energy efficiency. “We’ve always done what we could to help the environment,” Roy said. So, when they moved into their new home on 26th Street, they set about making it the best it could be. The most obvious change is to the landscaping. Roy and Mary developed an eye-catching remake of all the gardens and beds. Not so observable, however, is the work that Roy did inside. He went to work on the attics and basement, sealing up air leaks and insulating empty spaces. “I want this house to be as energy efficient as possible,” he said. After doing all he could by himself, Roy brought in the GreenHome Institute for an evaluation. GreenHome evaluated all the building systems and processed the data using the Department of Energy’s Home Energy Score system. The system scores a house’s energy efficiency on a scale from one to 10. The Cole’s home rated an eight. 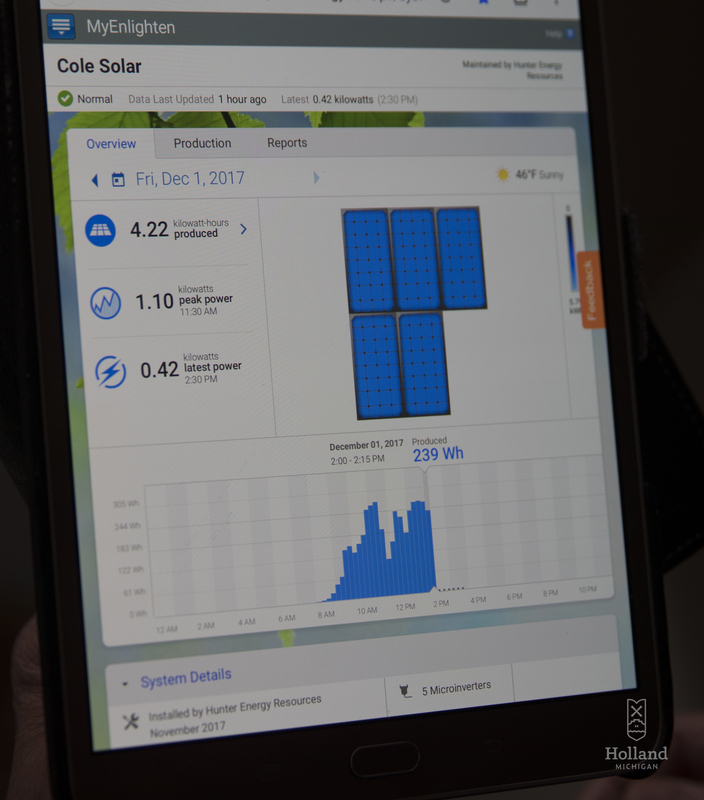 Solar panels are a later step in the energy efficiency process, after addressing more basic fixes such as insulation, air sealing, lighting and appliances. The Holland program covers 10 percent of qualified energy efficiency improvement costs. The Holland program brought in additional professional help. Ver Wys Home Improvement, one of the authorized contractors, inspected the home and made recommendations to further improve the air sealing and insulation. Hunter Energy Resources came on board to install the solar panels. The Coles are a first in Holland. 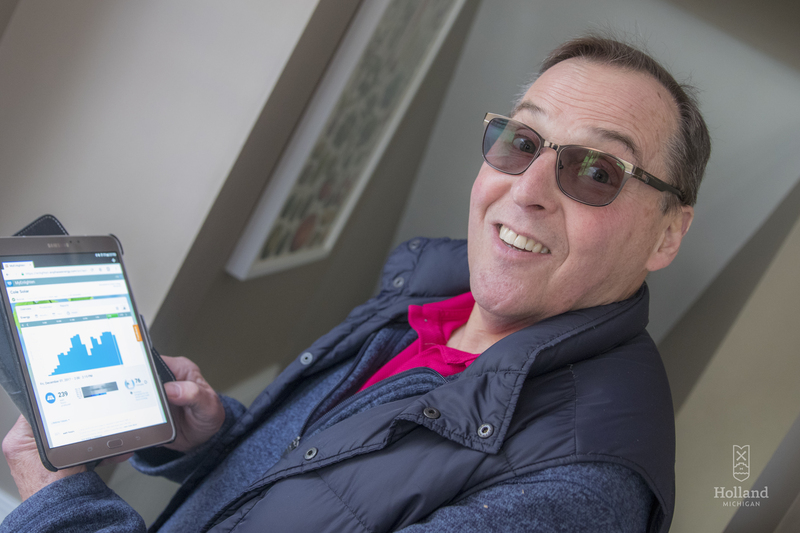 Roy Cole is able to observe his system’s power generation through an app. Homeowners working through the city and our residential energy advisor office have completed 78 projects so far, but the Cole’s project is the first using solar panels. An effective energy efficiency strategy moves through a series of steps. It is important in those steps to review all the home systems – air sealing, insulations, HVAC, hot water, appliances, lighting, and windows and doors. Solar panels are considered only after doing everything possible through those previous steps to lower a home’s energy baseload. Solar panels are the icing on the cake. In its Community Energy Plan, the City of Holland has a goal to become a world-class energy efficient city. Some 20 percent of energy used in the city goes into homes, and there is much room for improvement. All residential property owners in the city, including landlords, are eligible to benefit from the expertise and rebates provided through the city’s Home Energy Retrofit program. Learn more at www.hollandenergyfund.com or call Holland Community & Neighborhood Services Department at (616) 355-1330.  Peter Boogaart is the residential energy advisor for the City of Holland and assists homeowners with energy efficiency issues. Next Next post: Hope continues to earn national recognition for its long-standing tradition of teaching students through participation in research experiences.